One of the greatest features of our new house is our awesome master bathroom. It's big & colorful with hardwood floors, a big shower, & a huge clawfoot tub. 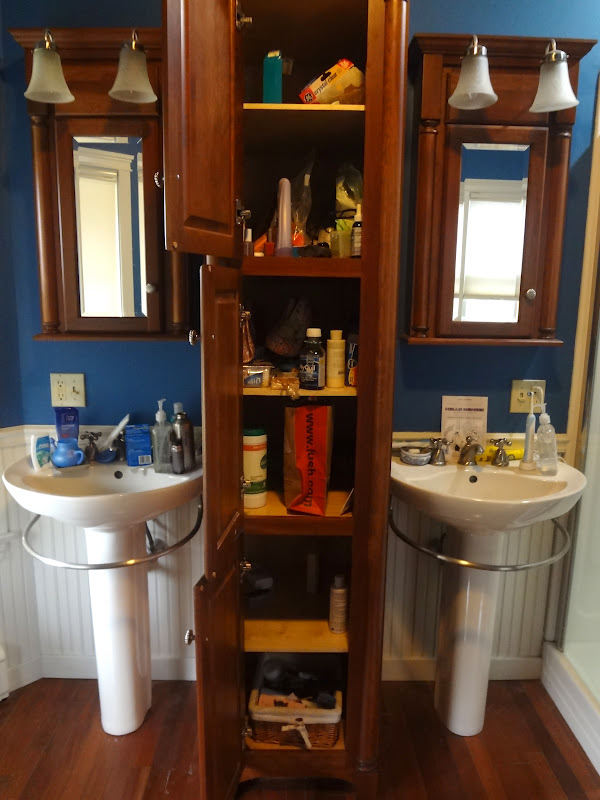 We have two sinks, separated by a wooden cabinet that stores any- & everything bathroom-related. When I buy new shampoo, it gets tossed in there. Extra face cream, nail polish, my hair dryer, travel-sized anything, lost makeup brushes - all piled on top of each other. I think I have about 6 gallons of Mario Badescu lotion in there, all because I kept buying stuff when I didn't know exactly what I already owned. When it took me five whole minutes to find a hairbrush in there the other day, I knew something had to change (that probably also gives you a glimpse into the day-to-day state of my hair). I grabbed some plastic storage containers from Target. I think I maybe spent $25 total, but I figured it would save me down the road when I wasn't double and tripling up on items I already owned. In some cases, "like with like" meant that the way-past-expiration Tylenol went with the gunked-up lip gloss which went with the almost-empty cough medicine which went with the eye makeup from college. In a big trash bag. The randomest thing I found in here was a almost-full pack of malaria pills from our trip to Thailand (I stopped taking them halfway through when I started having hallucinations). I guess this gets filed with the "Travel" items? ...and stacked them back up in the shelves. 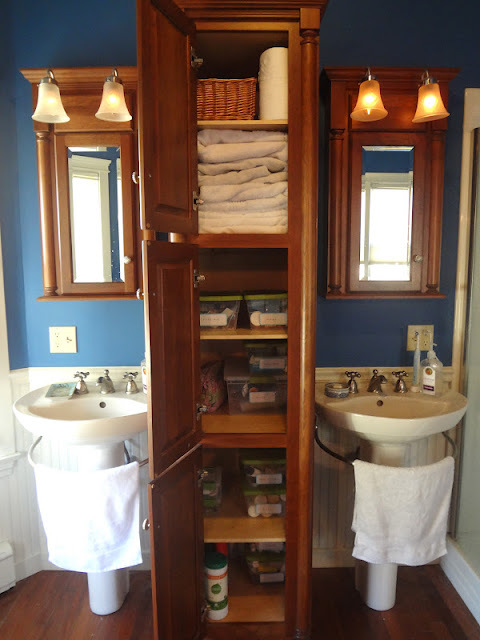 All of this extra space allows me to keep towels stored in here (we were keeping them in the master bedroom closet). From the top of this cabinet down, the shelves store extra toilet paper & washcloths, bath towels, first aid & meds, hair & makeup, body & face care, and travel items & bathroom cleaning supplies. It's going to take some upkeep to keep this space clean & organized but I love knowing where everything goes. Stay organized and stay homey! Hahaha any leftover cheeseburgers lying around? I really love how your bathroom is laid out. I would have the same problem with just tossing stuff in the fabulous cabinet. I am a total organization freak (by choice, not by nature), so reading your post is very satisfying. Looks great! Great cabinet. Next time you (or anyone else) is cleaning out the medicine cabinet, don't throw away your old medicine. Most communities now have pharmaceutical take-back programs to keep the old medicines out of landfills and water supplies. Good to know, thank you! This cabinet is actually due for another clean up, so I will keep that in mind as I inventory what stays and what goes.